Angry Typing Boy is Golden Boy as an adult, however he wears boyish clothing. He lunges forward toward his laptop, poised to continue an assault on the keyboard. He exudes hostility and paranoia in his stance while he glares at his own words. His hands and head turn red with anger as he transmits his own self-loathing outward into his immediate surroundings. 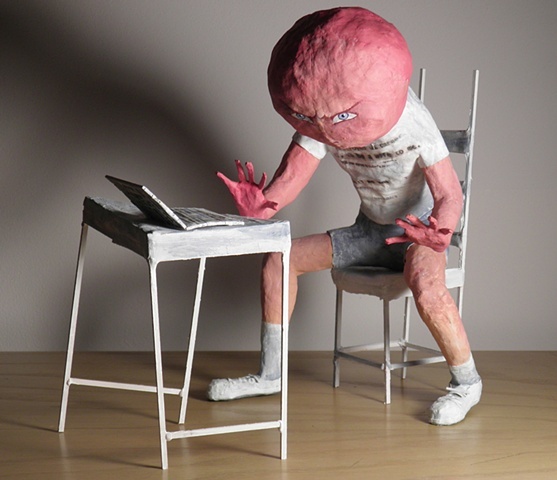 As Angry Typing Boy balances with precarious tension - on the edge of his seat - the audience is left to speculate as to what circumstances could bring him to this boiling point.